Spanish Baroque painter Sebastián Gómez was born around 1646 in Seville, Spain, a product of that city’s sizeable African-descended community. Ordinary benchmarks pertaining to most of his life—ancestry, circumstances of birth, parentage, identity of spouse, offspring, associates, and cause of death and a precise death date—have long remained a mystery, but at some point during Gómez’s childhood, he was known to be the household slave of Bartolomé Esteban Murillo, one of Spain’s preeminent painters of the seventeenth century. There has been much confusion regarding the life and artistic production of Gómez, largely due to the contention that another painter of the same name (i.e., Sebastián Gómez), a white Spanish student of the esteemed painter Alonzo Cano, was also active in the same century in Granada, Spain. A number of writers have identified works by “El Mulato” as inexplicably completed several years after his probable death. If in fact Gómez died in 1682, the same year of Murillo’s demise, as many of writers have recorded, this would appear to call into question works attributed to Gómez as late as 1700. Nonetheless, art experts have mainly been in agreement in attributing eight religious-themed works to Gómez: “The Virgin Mother With the Infant Jesus,” “Conception,” and “The Sacred Family,” each at the Cathedral Museum in Seville; “Christ Bound to the Pillar” at the Provincial Museum in Seville; “Epiphany” (Córdoba Museum in Córdoba, Spain); and portraits of St. Francis of Assisi (Hermitage Museum in Saint Petersburg, Russia), and Saint Anne and Saint Joseph (Cathedral Museum, Seville). Considered to be “of lesser genius but greater productivity” when compared to his contemporary, Juan de Pareja, Gómez’s paintings, though lacking in skill, sophistication, and variety, resided in more churches. As some critics have observed concerning the works of both Pareja and Gómez, certain painterly techniques, composition, application of colors, and texture are strikingly reminiscent of the masterpieces of their mentors, Velázquez and Murillo, in some cases to the point of being virtually indistinguishable. A black community of both free people and slaves in Spain was noticeable as far back as the late 1400s. Given their overlapping life spans and geographical proximity, Gómez and Pareja were probably aware of each other’s existence and accomplishments, but it is doubtful many of their African-descended brethren could have guessed their paintings would grace the walls of some of the great churches, mansions, and museum of Europe. 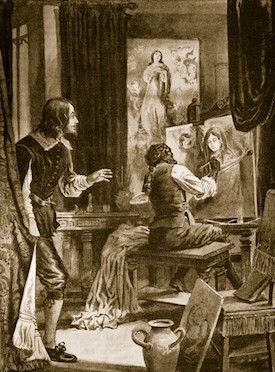 Robert Fikes Jr., “Juan de Pareja and Sebastian Gomez: Masters of Spanish Baroque Painting,” The Crisis (February 1980); Michael Bryan, Bryan’s Dictionary of Painters and Engravers. Vol. 2, (London: G. Bell, 1903); http://elbiblionauta.com/es/2014/05/01/el-zombi-y-el-mulato-de-murillo-ii-un-cuento/.